I have been fascinated with typographic ligatures for quite some time. Ligatures are a class of glyphs composed of two individual letters. There are two classes, historical and stylistic ligatures. Historical ligatures were present since the beginning of scripts, possibly to increase writing speed. Stylistic ligatures occurred more “recently”, with the invention of (analog) printing. The computer typesetting system TeX supported ligatures since its beginning in the 1980s. Other software, such as Word, introduced them much later. There are a myriad of historical ligatures in modern European languages. However, many people are not aware of them. For example, the German Umlauts ä, ö, and ü are ligatures. The two dots arose from superscript e. The circumflex in French (e.g. ô) originates from an s in Latin that became silent. Cedilla (fr. cédille, e.g. ç), also called hook or tail, is a subscript z. The name literally means ‘little z’. There are many more examples in modern European and other languages, not necessarily originating from Latin or Germanic. In TeX/LaTeX, typesetting these historical ligatures involves either the inputenc package or the backslash escape character (i.e. ‘\’). The first lets you type many special characters directly. It is important that the option used is the same as the tex file encoding, here utf8. Note, the ampersand is a reserved character in LaTeX (e.g. for tabular column separation) and has to be escaped in any case. For a comprehensive list of escapable characters see: The Comprehensive LaTeX Symbol List. To finish, a fun fact about ampersand: The word ampersand is a corruption of the phrase “and (&) per se (means) and”. 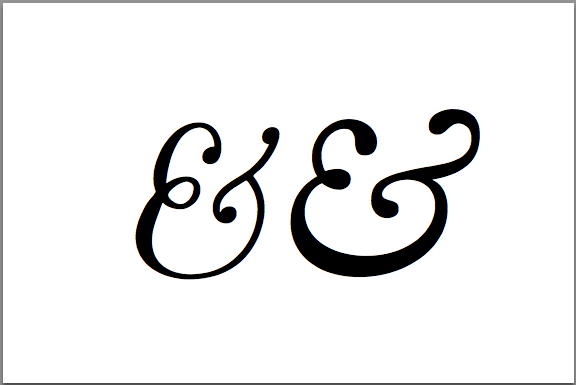 Source Wikipedia: Typographic Ligatures and Ampersand. Please turn on “full post in RSS”! Thank you. Thanks for the notification. I can see the full post in feedly and a feed reader app for iPhone. The feed should be this url: http://texblog.org/feed. Which reader/feed are you using. I’d be curious to test it out and if possible fix it. Thanks! Best wishes, Tom. Aha! I had a feed URL of http://feeds.feedburner.com/texample/community from http://www.texample.net/community/ I’ll subscribe to your feed directly. Thanks for the info. Right, in the TeX community aggregator only an excerpt of articles is shown. Best, Tom. ß is not a stylistic ligature. As the name suggests it is a ligature froms S (“ess”) and Z (“zett”) in Fraktur-Script. Removed that part from the post. Thanks for the clarification, appreciate it. Cheers, Tom. I understood that that was a ligature for two ‘s’s — A long s (rendered similar to f) and a short s as in “Essen”. Maybe that’s the same thing you’re saying, but I guess my question is about the ‘z’ as opposed to a short s — which may be the same sound in germanic languages. According to Wikipedia, the long s is not a ligature, but a letter that developed when upper and lower case letters became established. There were several companies doing digital ligatures long before Knuth released TeX: Autologic, Computype, Logidec, Alphatype, etc. Thanks for pointing this out. I rephrased the part of the paragraph which was wrong. I’m curious to learn more about these other companies. Was playing with different file encodings and forgot to set it back to utf8. Thanks for the notification, I updated it.